Tessa and Zachary had a shiny machine. It was a green machine. It was a clean machine. It was a cozy and comfortable and calm machine…. But one morning, the machine chugged and spluttered. It coughed and choked and it would not budge. “How are we going to get to school? said Zachary. It was a red thing. It was a sparkly thing. 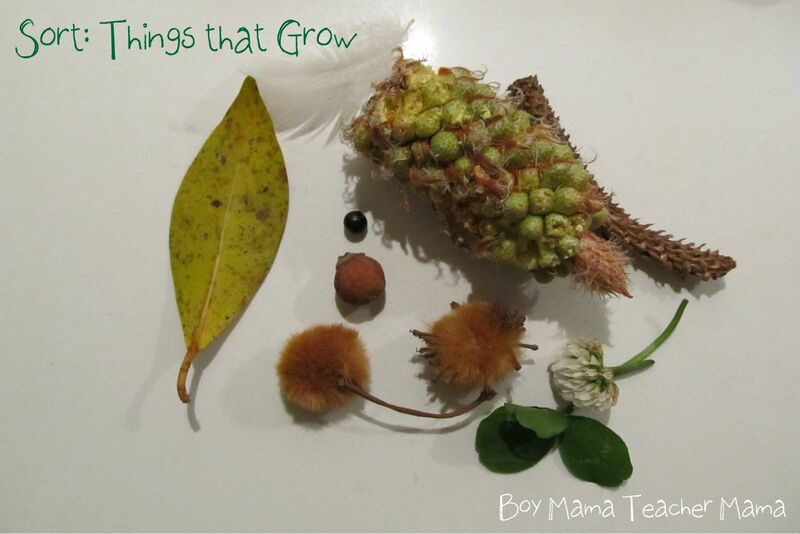 Ten Tiny Things is a story about slowing down, enjoying the moment and finding joy in the little things, “the secret somethings and the hidden happenings.” My boys and I followed Zachary and Tessa’s lead and took a ten tiny things walk as well. Here is how our walk went. 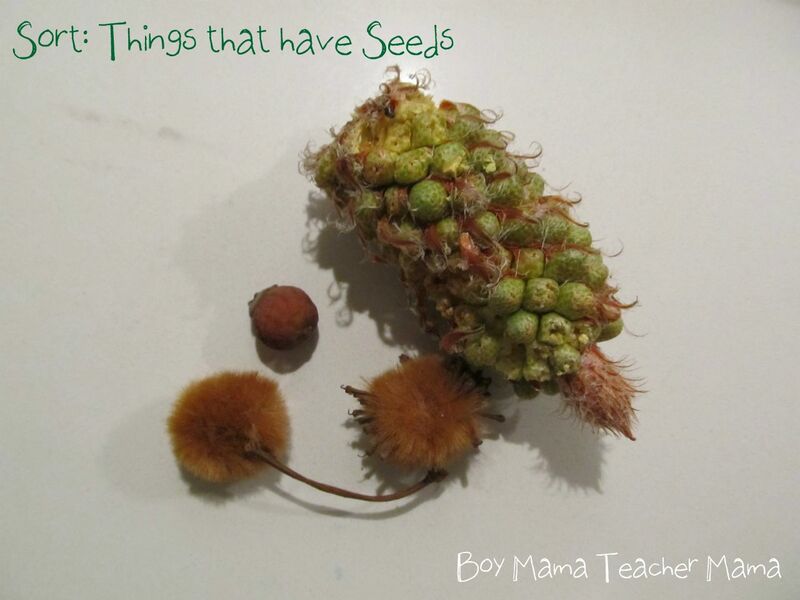 I gave my son a bag and said, “While we are walking, I want you to look for ten new things. Ten new things you have not seen or noticed before.” And we began walking and as we walked we noticed the small stones that made up the sidewalk. We noticed all the different things that had fallen from trees. We noticed the rubbish in the streets and the cigarette butts along the sidewalks. We noticed bottle caps, coins and even a lost earring. We noticed feathers and flowers and puddles. It was amazing how different the world seemed during this walk. It was as if we were somewhere we had never been before…. 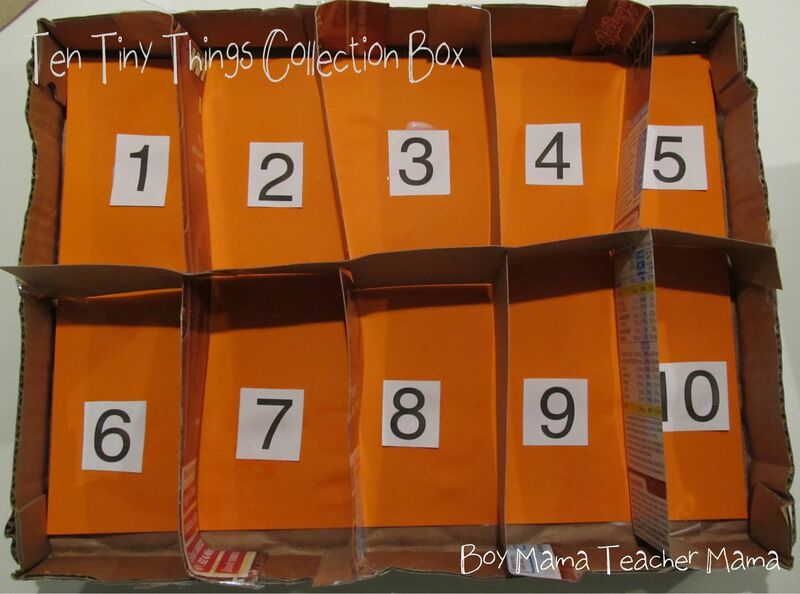 I created this Ten Tiny Things Collection Box. I made it from a cardboard tray that came with our canned dog food and a cereal box. I printed the numbers 1-10 on my computer and glued them in place. 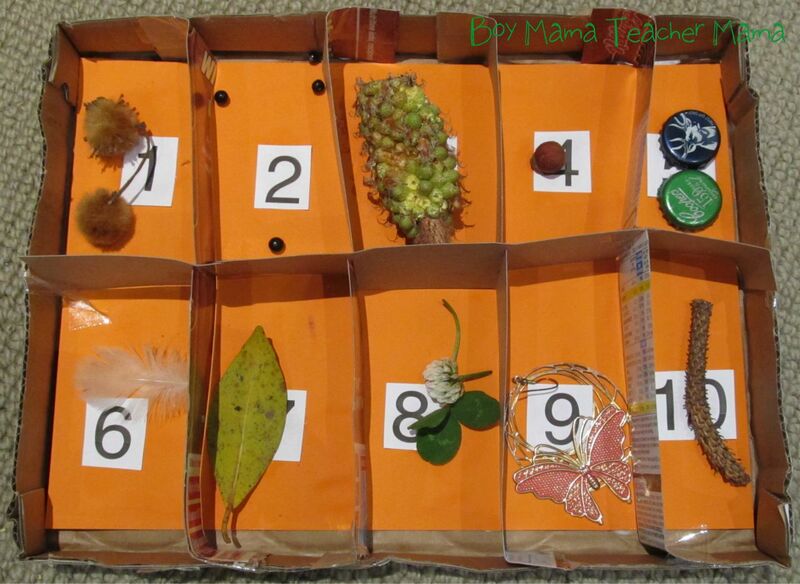 I had my son put the ten things we collected on our walk in our collection box. We talked about our findings. We talked about our walk. Then we sorted our items in a variety of different ways. When we were done, we talked about taking another Ten Tiny Things walk in a different area to see what we notice and what we can find. What a wonderful way to encourage him to open his eyes wide and find new things. That is so fun. Great for number recognition too. I can’t wait to try it. Thanks for linking up at Mom’s Library! I just love this idea! 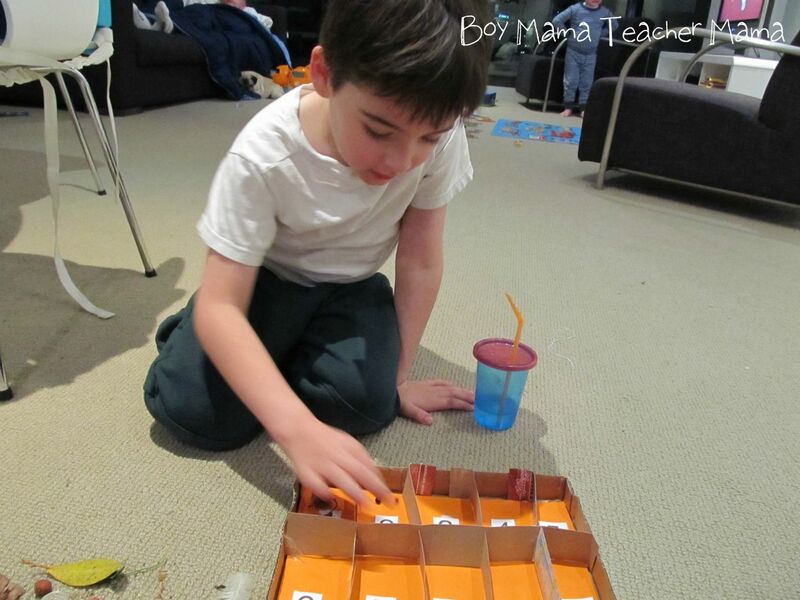 What a great way to encourage kids to concentrate and truly observe in a whole new way. I love your ten tiny things box too. Pinning! After reading your post I have now added this book to my list of ‘must have’! So many fabulous ideas! It is a must have in my mind!!! 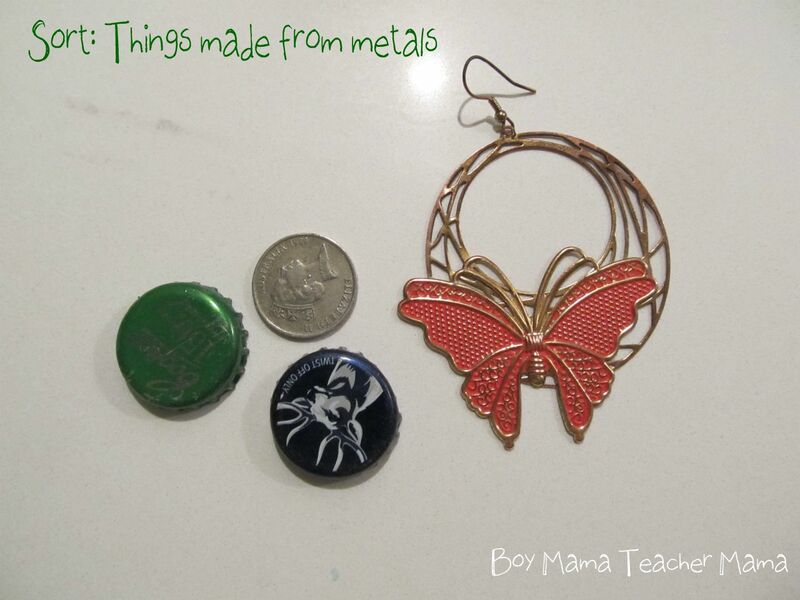 fabulous idea… my kids love treasure hunts and the like. Must see if I can find that book at our library. This is a beautiful idea, my little one would love it too. Thank for yet another wonderful activity. Wonderful connection to the story and the sorting part… Bonus! Thanks for sharing such a great idea! I looooove this Stephanie! I might do something similar with Miss Possum. I wonder if I could manipulate this idea to finding ten animal items (that may be hard though). Oh! I love it! Haven’t heard of this book before but am going to order a copy right now. Such a great message and I love how you have taken that message to the next level with your activity with your son. 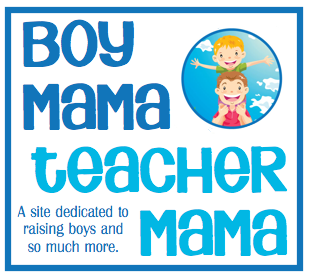 He’s a lucky boy to have such a creative Mama! I like this idea! 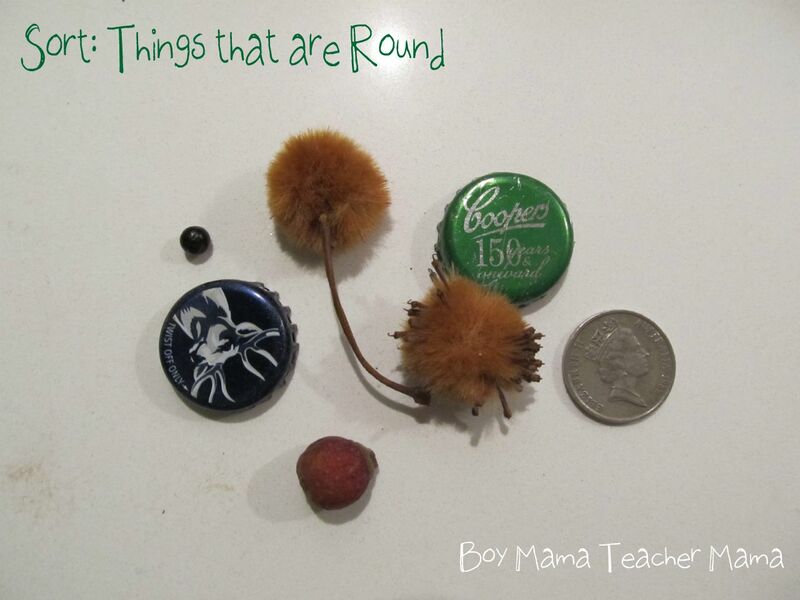 We take walks all the time and the kids are used to focusing on the little, beautiful things- but we usually hand carry them home. Maybe we’ll take egg cartons on our next walk! Thank you for sharing. This book has been on my ‘TO-BUY’ list for a little while. 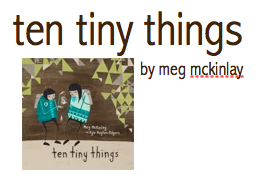 ….and I just love your Ten New Things activity.